Our bodies are the most personal thing we have. Every living thing on the planet has its own unique combination of DNA. Our DNA, interacting with the environment, creates an organism that will never be seen again in the universe. The cloned sheep Dolly was not the same as her doppelganger. Not even the most identical of identical twins are the same. In humans, our genes not only control how we look, but how we think too. Contained in our DNA is the recipe that governs the development and organisation of the neuron cells in our brain, from which comes our own private consciousness. If there was one thing in the world that could be said to be under our complete control it was our own bodies. Unfortunately, like in many other aspects of life, there are those willing to abuse, interfere and dominate the private lives of others. In the realm of biology, these unscrupulous individuals are called parasites. For them, the bodies and minds of others are an easy resource to exploit, used to further their own ends. Parasitism is so successful it has evolved independently countless times. While some may be rather modest in their demands – such as a mosquito drinking a droplet of blood from a cow or pig – others can ask for the ultimate sacrifice. Such is the case of a wasp named Leptopilina boulardi. These formidable looking insects decide not to expend their energy feeding their offspring. Instead, it decides to hire a baby sitter – a fruit fly larvae. Using a syringe-like tail, it pierces the flesh of the insect and lays its eggs in the fly’s body cavity. You might think that would be painful enough, however, the future of the fly gets decidedly bleak. Over the course of a few days the fly is eaten from the inside out. Once fully developed, the adult wasp emerges from the body of the fruit fly larvae – a morbid parody of a butterfly emerging from a chrysalis. Because the wasp larvae kills its host, rather than just using it, its described as a parasitoid. The tale of Leptopilina is stranger than this though. Most mother wasps only lay one egg inside each fly larvae, since they can only provide enough food for one adult to survive. Should a wasp try for twins or even triplets, only one will survive. This is why wasps avoid fruit flies that have already been attacked by others – the chances are that its own offspring won’t survive. In a delightful twist of irony, however, there exists another parasite which manipulates the wasps to lay eggs in already occupied larvae. This parasite is a virus called LbFV and is passed down from mother to offspring. Inciting this behaviour change is incredibly helpful for the virus, because it means previously unaffected families of wasps can be infected. The virus can spread and spread, at the expense of the wasp’s reproductive efforts. The genes of the virus extend past the confines of its own physical presence, warping and controlling the mind of an organism 20000 times bigger than itself for its own benefit. 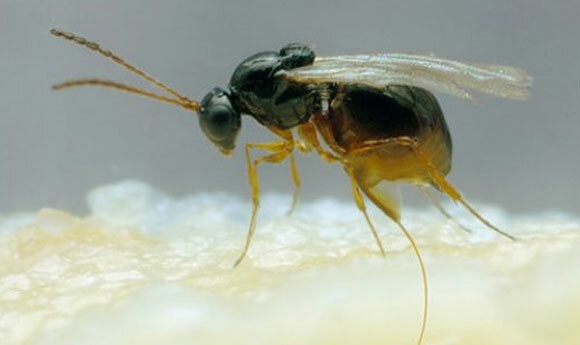 The wasp, in turn, impacts the lives of dozens of fruit flies. This tiny virus can end up influencing an entire ecosystem. Viruses could be described as the ultimate parasite. They have lost nearly all of the apparatus needed for something to be defined as alive. They contain only a few genes, surround by a protein coat. To replicate – or in other words to live – they must use the cellular machinery of a host cell. Outside a cell, they cease to be alive. They are but a collection of proteins and nucleic acids. As well as viruses, are bodies are home to huge numbers of bacteria, fungi and protozoa. It is thought that bacterial cells outnumber our own by more than ten times. Just like the LbFV virus, their genes are having an influence on our bodies, changing it for their own benefit. We are far from being independent masters of our own destiny, we have been invaded by body snatchers.